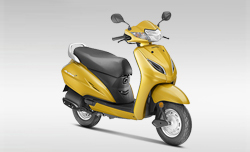 We recommend Honda Activa 5G to be a nice choice in its segment. Honda Activa 5G seems to justify with its tag line “Love is Growing” perfectly. It is available in various attractive colours such as Black, Dazzling Yellow, Majestic Brown Metallic, Matt Axis Grey, Matt Selene Silver, Pearl Amazing White, Pearl Spartan Red and Trance Blue Metallic. If we talk about its technical features that make the vehicle capable of justifying with its performance are based on its 109.19 cc engine, with maximum power of 5.86 kW @ 7500 rpm and maximum torque of 9 Nm @ 5500 rpm. It is available with Automatic gearbox and runs on Petrol. It is equipped with 5.3 liters fuel tank. Activa 5G is 1158 mm high, 1761 mm long and 710 mm wide with Kerb weight of 109 kg. It has ground clearance of 153 mm. Activa 5G completely justify with safety and comfort features. It is equipped with Tubeless Tyres, with Steel wheels and with electric start. Overall we find that Activa 5G gives good value to money and it is a great choice for buyers.